LeapFrog is one of the innovative creators of top learn and explore toys for children. Their approach to toys is often the introduction to technology that young kids excel in learning with. Now they've done it again. 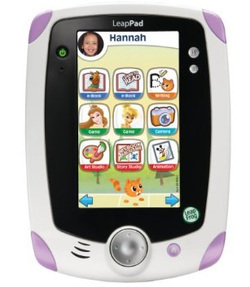 Thanks to the LeapPad Explorer from LeapFrog, kids are seeing that learning is educational, fun and exciting. The software on this gadget is way ahead of anything in the field of learning gadgets for kids. With this new learning tablet, your child will have the ability to tap into more than 100 educational books plus games, fun learning videos, and handy applications. This early learning technology also helps prepare your child to be technologically savvy in a world that grows more advanced by the hour. This fun yet educational gadget covers subjects that help kids learn. For example, maths, science and reading are broached in a way that allows the child to interact as he learns - and this method of teaching is highly effective in helping children retain what they learn. The LeapPad Explorer from LeapFrog is created in such a way that the design makes it easy for their little fingers to hold onto and it's thin enough so that it won't weigh them down. LeapPad Explorer - Techie AND Tough! Because kids will be kids, the product was also created to withstand the stress kids put the product through as they live life at supersonic speed. This learning tool is built with the knowledge of how kids like to play and learn, so the LeapPad Explorer can be flipped and turned about by little ones. With a sensor for tilt and an easy to see 5-inch screen, it's easy for kids to engage in learning. One of the fantastic features about this product is the built in camera. Putting a product with a camera like this into the hands of a child opens up a world bursting with imagination for them. They can take photos, make videos and make creations they'll want to show off to their family and friends. It's easy to do, thanks to the vocal instructions that guide them in editing their creative projects. One of the many applications that taps into a child's imagination and creative ability is the Story Studio and Art Studio application. These are applications you can get at no extra cost, and it lets your child put their creations into storybooks. You'll also discover that LeapPad Explorer from LeapFrog is unparalleled in helping kids master reading. These interactive learning experiences are designed so that the reading level adjusts as your child's reading grows. This aids a child in building comprehension in reading and growing an extensive vocabulary, too. He can tap the word and an image showing what the word is will show up. If he goes on to touch the image, it will show the word and the LeapPad will also sound the word out for him. Keeping your child engaged in learning at a young age is a wonderful foundation to help him educated to the fullest. Like this top Christmas toy for girls, but more into pets than tech? Take a look at the Fur Real Cookie My Playful Pup instead!